I hope you all had the best Easter ever! Ours was very quiet and cozy. With one kid down in the flu and a new puppy (four months old now) we were pretty much bound to the house. But as our boy slowly got better, at least we managed to get out for a short hike in the woods yesterday + fika (=coffee and cake) at Gunnebo Slott. So sorry though, for not posting this recipe before Easter instead of after… With the puppy in the house, and still trying to manage my work with the little rascal sweetie pie around, I’m not that good at planning any blog posts at the moment. If you’re anything like me you’ve probably had your share of chocolate this Easter anyway. 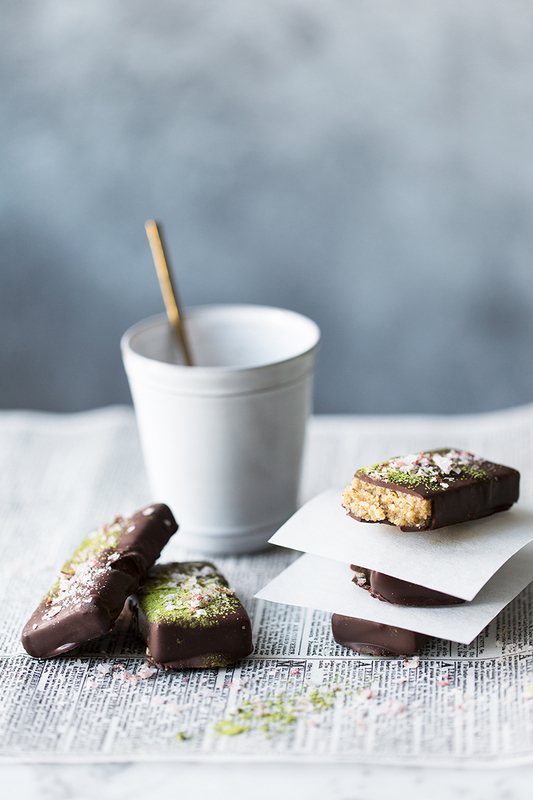 But these bars contain only good stuff, which make them perfect as a small snack in the afternoon when cravings set in! I was inspired by Japanese flavors when creating this recipe. 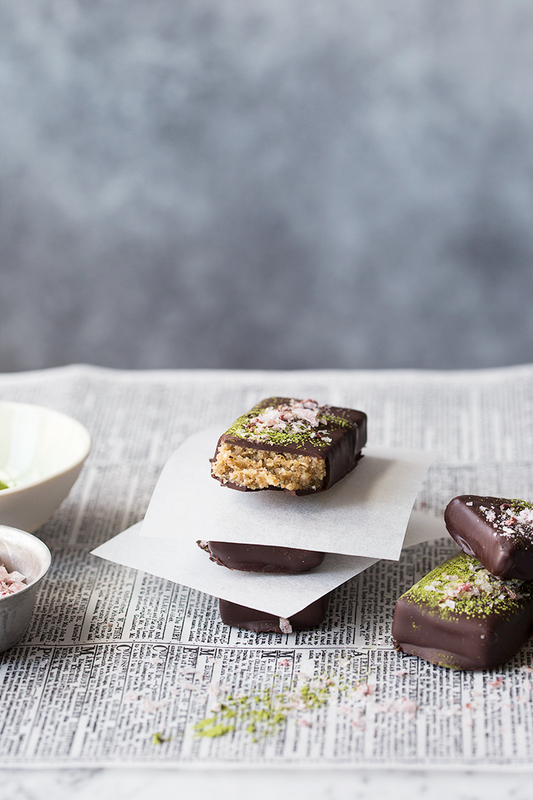 The bars are only sweetened with a small amount of rice malt syrup and then covered in 70% chocolate. And if you’ve never tried miso in a sweet way before – then you have got to try!! So good! Just make sure you use a good quality miso – preferably organic and unpasteurized. My favorite brand is Clearspring. A little note on the salt too, cus I had quite a few questions regarding the salt on Instagram. It’s an Icelandic product from Nordur Salt and it’s made with hand harvested sea salt from Breiðafjörður (how exotic does that sound?) and Arctic rhubarb that grows wild in the Icelandic nature. The result? A delicious sour-salty taste with a fresh smell of rhubarb. So pretty to look at too, don’t you think? 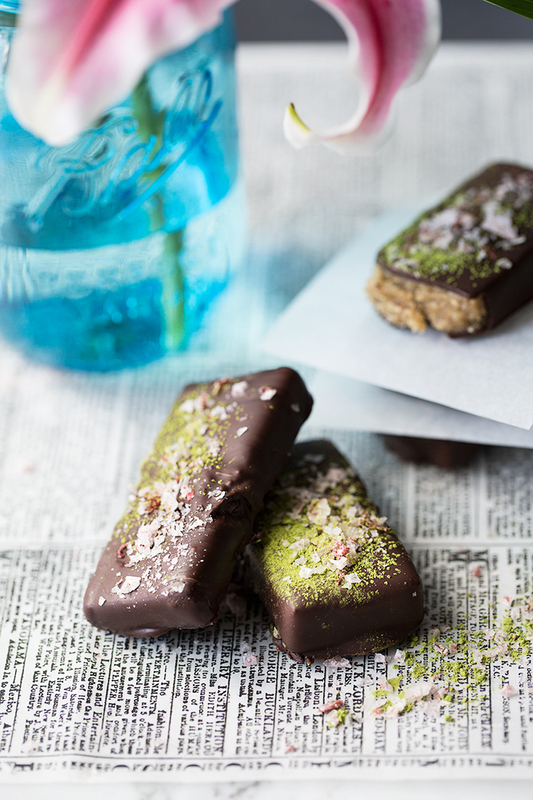 If you can’t find it, you can always use Himalayan salt instead – if you like the pink touch to your bars that is. Otherwise simply use flaky sea salt or fleur de sel. Now, who wants the recipe? Enjoy! 1) Put the walnuts into the bowl of a food processor and blitz for 5 minutes, until the nuts are beginning to turn into a soft butter. Add the rice malt syrup, coconut oil, miso, vanilla and a small pinch of salt and blitz to combine. 2) Add the almond flour and sesame seeds and blitz again until you have a scruffy dough-like mixture. 3) Tip the dough into a lined baking tray and use clean hands to even it out into a square about 1 cm thick. Put the baking tray into the freezer for at least 30 minutes. 4) Melt the chocolate in your micro wave oven or in a bain-marie, and and allow it to cool and thicken, stirring occasionally. This step is important, so that the bars will be thickly coated. 5) Take the walnut mixture out of the freezer and cut it into about 16-20 bars. Pop them back into the freezer to chill again. 6) Take the frozen bars out of the freezer and dip them into the chocolate, using two forks to turn them, then lay them on parchment paper. 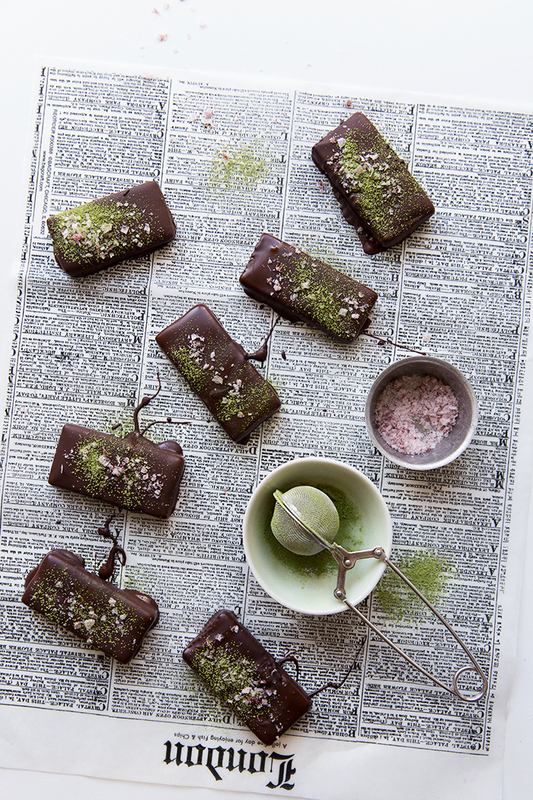 Sprinkle immediately with matcha powder (using a tea strainer) and rhubarb salt. 7) Once set, the bars can be stacked in an airtight container and kept in the fridge for up to a month. They also freeze really well.